Liam Glynn in action in the Baltic Sea on Sunday. IRISH SAILING’S LIAM Glynn secured a bronze medal at the U21 Laser World Championships on Saturday in Poland from a fleet of 133 competitors spanning forty countries. The 19-year-old sailed an outstanding series in difficult shifty conditions on the Baltic Sea on the penultimate day, scoring two 3rd places which put him in pole position coming into Sunday afternoon. A strong charge ultimately meant he missed the title, but such was the strength of his series he still took the bronze medal for Ireland. 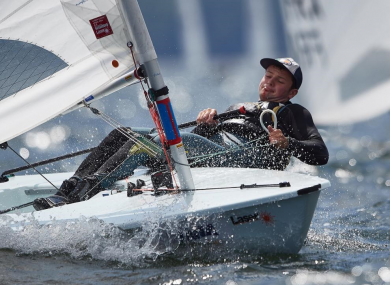 As a junior Glynn won the Topper World Championships in 2013, with this second World Championship medal in the Laser class boding well for his future potential in the Olympic discipline. The result qualifies the Belfast sailor for the Irish Sailing Senior Team in 2019, meaning he will compete at the Olympic qualifier in Aarhus, Denmark in August. Performance Director for Irish Sailing James O’Callaghan said the 19-year-old’s display bodes well for the development of young talent in Irish sailing. “Liam has had an amazing week and his medal is further evidence of our Performance Pathway brimming with talent,” he said. Email “Bronze for Ireland as 19-year-old Liam Glynn bags medal at World Championships in Poland”. Feedback on “Bronze for Ireland as 19-year-old Liam Glynn bags medal at World Championships in Poland”.